Please arrive early! Over 20,000 people will be trying to park on race morning. Traffic will be heavy. Every participant will receive a men's or women's technical, moisture wicking shirt. Medals will be given to all finishers in the 15K. The elite women start at 7:54 AM. The first seeded wave of the 15K starts at 8:00 AM, Waves Two, Three and Four will start after a short delay between each wave. The starting line is on Gator Bowl Boulevard between the Stadium and Metropolitan Park. 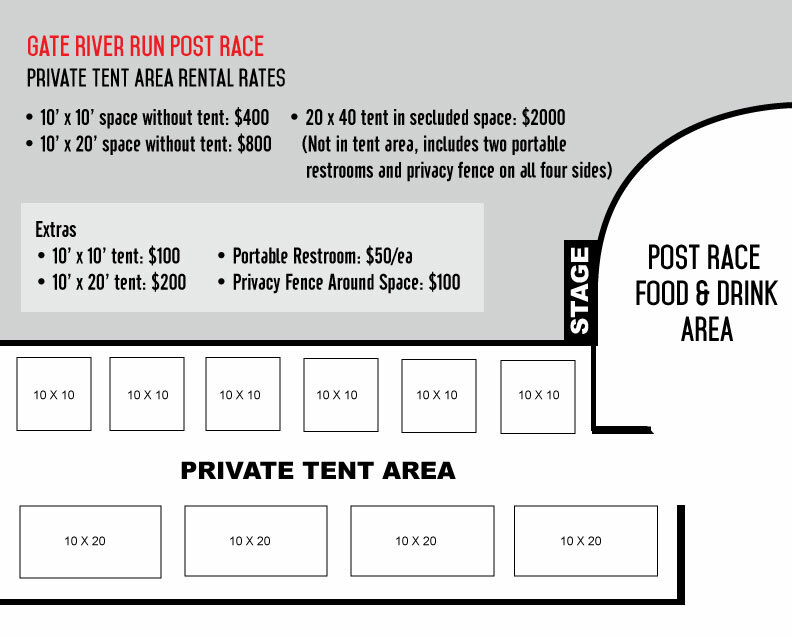 Portable restrooms and a bag check are located in lots J and D.
All runners and walker should be in position by 7:30 AM. Walkers should start at the back of Wave 4 on Gator Bowl Blvd. Make sure to wear your race number on the front of your clothing. This is the only way to be identified for online pictures. All miles will be marked and digital clocks will display the elapsed time at each mile mark. Water Stations and toilets will be located throughout the course, and entertainment will be provided each mile during the race. All 15K participants need to be to the Hart Bridge, which is at mile 7.5, by 10:30 AM. This is an 20 minute/mile pace. Gator Bowl Boulevard between Georgia and Duval Streets - Road will be closed from noon on Friday, March 8th until 1 PM on Saturday, March 9th. There will be a bypass around the starting structure on Friday through parking lot J for in bound town traffic and through parking lot K for from town bound traffic. This Zone is located at the front of the starting line on Gator Bowl Blvd. This wave, which will start at the sound of the cannon, will include the Top 5,000 seeded positions. Runners in Wave One will be seeded into six color zones based on submitted qualifying times. These zones will be filled on a first-come, first-serve basis: Yellow Zone 1-300, Blue Zone 301-800, Red Zone 801-2000, Green Zone 2001-3500, Orange Zone 3501-4500, Black Zone 4501-5000. If you already have your qualifying time, register now, so you know you have a spot in one of these seeded zones! Follow these steps to receive a Top 5000 Seeded Number. You must run a qualifying time in a 1st Place Sports running event, or a USATF certified running event within the last year (January 1, 2018 through March 7, 2019). Qualifying times are listed in the chart below for each Wave One color section. Once you have run your qualifying time, you can register for the 15K Seeded Section. You will be asked to submit your A) USATF Certified Event Name B) Event Date C) Event Distance and D) your finish time. Once you have registered and submitted your qualification information, we will not accept any other qualifying time! You cannot submit your entry as non-seeded, run a qualifying race, and then try to switch your entry. Only those who register for the Seeded Section will receive Seeded Numbers. Any qualify times that can not be verified or are incorrect will automatically be removed from Wave One and placed in the appropriate Wave. There are absolutely NO EXCEPTIONS to these rules. It is your responsibility to read and understand the guidelines. Don't wait too long to send in your entry! Seeded Sections fill up quickly! Do not wait too long to submit your registration, or the seeded section you were qualifying for might already be full! Once a seeded section is full, any additional qualifying runners will be seeded in the next available zone behind the requested zone. All four waves will be using the same restrooms, bag check tents and start water stations. Restrooms will be located in Lots J and D on the north side of the starting line on Gator Bowl Blvd and the restrooms in Metropolitan Park will be open on the south side of the starting line. Bag Check will only be in one main tent, which will be located in Parking lot N behind the finish line on the north side of the stadium. You will drop off and pickup your bags at this tent. Start water stations will be available in Lots J and D and at Metropolitan Park. Wave #2 has room for 5,000 runners. Once this section fills, any entries received will be assigned to Wave #3 or #4 based on availability. The Grey Zone (Wave #2) will be located directly behind the Top 5,000 seeded runners on Gator Bowl Blvd. There will be a grey starting banner across the road. You can enter the starting line from either side of the road. Please line up in this section based on the pace you plan to run. Pace flags will be located on the side of the road. Wave #3 has room for 5,000 runners. Once this section fills, any entries received will be assigned to Wave #4. The Purple Zone will be located directly behind the Grey Zone on Gator Bowl Blvd. There will be a Purple starting banner across the road in this section. You can enter the starting line from either side of the road. Please line up in this section based on the pace you plan to run. Pace flags will be located on the side of the road. The Pink Zone will be located directly behind the Purple Zone on Gator Bowl Blvd. There will be a Pink starting banner across the road in this section. You can enter the starting line from either side of the road. Please line up in this section based on the pace you plan to run. Pace flags will be located on the side of the road. All classes will start together ahead of the Elite Women. Athletes with a certified disability can ride in the Handcycle class on three wheeled recumbent cycles. There will be a dedicated Disabled Competitors Parking Area near the starting line, and all disabled competitors will receive a parking pass. These will be available in the Race Packets, plus a general instructions sheet, also in the packet. Please contact Donald Hall at st_elmo@bellsouth.net, or call (904) 246-9190, if you are interested in participating in this division. Bring the whole family! Encourage your friends, family, church, school, or civic group to participate, and help us raise thousands of dollars for our charities! This is a timed 5k! All participants will receive a technical shirt and a finisher medal. All 5K finishers will receive a custom designed finisher medal. The 5K will start on Duval Street in front of the Jacksonville Fairgrounds. The 5K will finish inside the Fairgrounds entering from Randolph Ave. Important note: The 5K starts at 8:00 AM at the same time as the 15K! This is a 5K for Charity! Half of each entry will go directly to our charities! Last year we raised over $35,000 for our official charities. In 35 years, we have raised a total of over $1,000,000 for local charities. A FREE one mile fun run for children! The Gate River Run and JTC Running are proud to present the Junior River Run. It's free to any child 13 years and younger. All children who sign up for the in-school training program will receive a free training t-shirt. All children who complete the one mile fun run will receive a t-shirt and goodie packet on raceday! This race is limited to children 13 and under. Each child's parent must fill out and sign an entry form for them. Participants must pre-register (online or instore) if signing up as part of a team. If signing up as an individual, you can pre-register, or sign up on race morning. Pre-registration ends on March 6th! First race starts at 11:00AM on March 9, 2019. There will be four heats. Boys 9 & under at 11:00 AM. Girls 9 & under at 11:15 AM. Girls 10 -13 at 11:45 AM. The assembly area for this event will be inside the Fairgrounds near the starting line. Each group will assemble in this area about 20 minutes prior to their starting time. Each group will then be moved to Duval Street for the start of their race. Parents can run with their children if necessary, but for the utmost safety of all participants, if you think your child can handle this event without you, we would appreciate your waiting for the child at the finish line. Download the In-School Training Program Packet below! All students who participate in the eight week training program will receive a free "Training for the Junior River Run" t-shirt in addition to the regular Junior River Run shirt, and an entry into the Junior River Run to be held on March 9, 2019. The purpose of the program is to familiarize our youth with the benefits of exercise and of course get them ready for race day. The ideal is to have the children run 8.3 miles in their training program, and then run one mile on Gate River Run Day. That would mean they have covered the full 15K distance. We hope your school will get involved and help us make this the largest Junior River Run to date. The race will start on Duval Street in front of the Jacksonville Fairgrounds. The start will be near the intersection of Duval Street and Randolph Boulevard. The race will run west on Duval Street doing an out and back mile to finish inside the Fairgrounds near the starting line. Please join us for this 1 mile event to enable and empower individuals living with disability. We welcome people of all ages and abilities to come together in this powerful community wide event. You may wheel it, walk it, jog it or run it. Volunteers will be there to assist you with a push or a steady hand as needed. This is a great celebration of our diverse community coming together for some fun, fitness and friendship! This is a free event but you must pre-register online. Each participant will receive an event t-shirt and a finisher medal. Bibs and shirts will be distributed at the event tent from 8:00 am - 9:30 am or at the pre-registered bus transport locations. There is no packet pick-up for this event at the Expo. Brooks Rehabilitation will provide free bus transportation to pre-registered Challenge Mile participants from select Brooks Rehabilitation locations. If you would like more information, please email ChallengeMile@brooksrehab.org. The Diaper Dashes will be held to the left of the stage at the Jacksonville Fairgrounds. The dashes will start about 11:00 AM with each division starting as soon as the younger division is finished. Race day registration only! Please sign up your child at the start of the race. Each Diaper Dash will be 25 to 40 yards. Registration is free and includes a Diaper Dash T-Shirt! Starts at 11:00 AM in the Jacksonville Fairgrounds next to the stage. The GATE River Run will be using Bib/Tag Race Results system to time runners. Your Timing Chip will be located on the back of your race number. We will have mats at the starting line, 5k point, 10k point, and at the finish, which will enable us to give every runner a net time. The net time is the time it takes to run from the actual starting line to the finish. The cost of renting a chip is included in the entry fee. 1st Place Sports uses Bib Tag Timing Chips to time most of our races. This radio frequency based technology enables runners to receive an exact select time as you cross the finish line. This technology will speed up the results process and enable less lag time between the race and the awards ceremony. The team from Marathon-Photos.com will be taking photos along the course. Wear your best smile as you cross the finish line. Photos will be online promptly. Order any download and share on Facebook immediately to show your friends! Click here to find your photo! All participants receive a moisture wicking shirt. Men's shirts are cut with a crew neck and women's are cut with a v-neck. You will not be able to exchange shirts, so please choose accordingly. Awards will be presented at the stage starting at 10:00 AM. Cash to the top ten men and women as follows: 1st $10,000, 2nd $5,000, 3rd $3,000, 4th $2,000, 5th $1,000, 6th $900, 7th $800, 8th $700, 9th $600,10th $500. The top 25 seeded women will start 6 minutes ahead of the rest of the field. The first person (male or female) to cross the finish line will receive a $5,000 bonus. This bonus is based on the difference between the men's and women's American record for the 15K distance. Must be resident of Duval, Clay, St Johns, Nassau or Baker counties for the past six months. Top three in each of the following 15K age-groups: 13 & under, 14-19, 20-24, 25-29, 30-34, 35-39, 40-44, 45-49, 50-54, 55-59, 60-64, 65-69, 70-74, 75-79 and 80 & over. Age Group awards will be given out after the race in the post race area. Custom-designed running caps will be given to the top ten percent of male and top ten percent of female finishers. These will be distributed at the finish line. 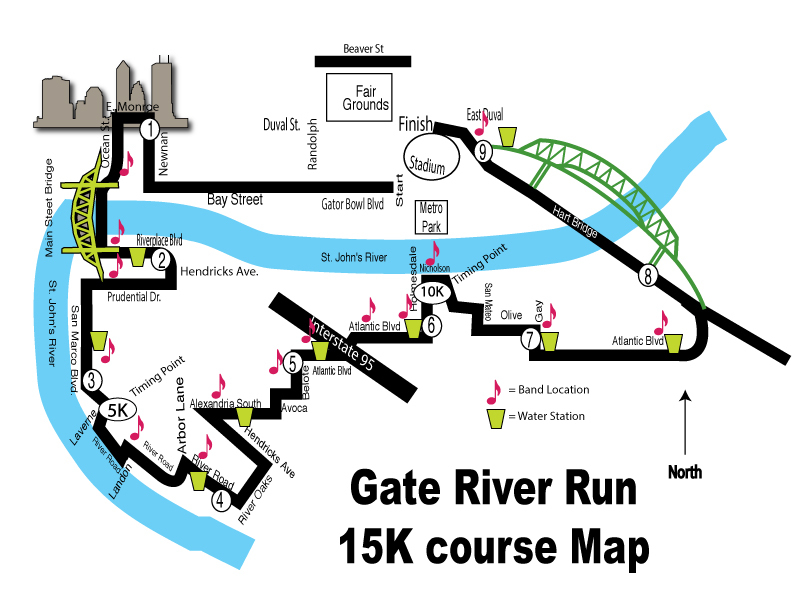 The GATE River Run is proud to present a special custom-designed medal to all 15K and 5K finishers. Each 15K finisher will receive their medal in the finish area.